Here's an overview of important details you should consider when planning how to build out, configure, and manage your SharePoint Online environment. A site collection has the same owner and shares administrative settings, such as permissions. When you create a site collection, a top-level site is automatically created in the site collection. You can create subsites below the top-level site. Instead of using subsites, we recommend creating a separate site collection for each unit of work, and connecting them by using hub sites. To learn more, see Planning your SharePoint hub sites. Communication sites and new team sites that belong to Office 365 groups can't be created or managed in the classic SharePoint admin center. For info about creating and managing these sites using the new SharePoint admin center, see Manage sites in the new SharePoint admin center. If you figure out a few basic details.—for example, what a site collection will be used for, and which users need to have access to it—then this will help you make decisions about what type of site template to use, how much storage to allocate, and how many site collections you might need to create. 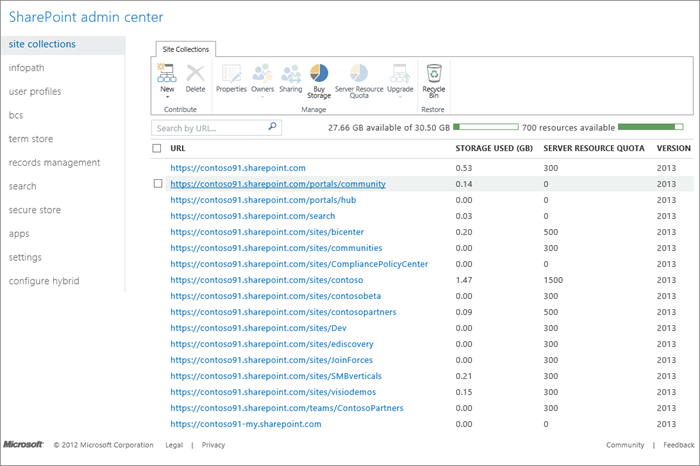 If you need to review your storage limits or the number of site collections that are supported for your plan, see SharePoint Online Limits. For info on the new site templates and the variety of classic templates available in SharePoint Online, see Using templates to create different kinds of SharePoint sites. Do you want to connect a group of people for collaboration, or do you want to broadcast content to a larger audience? Will the site fill a specialized purpose? How many site collections do we need? Business needs and your overall storage limits will affect this decision. Certain types of sites, like the App Catalog and Search Center, exist as standalone site collections. Some of these may be automatically created for you when you sign up for Office 365. You may need additional site collections if your organization has other specialized purposes. For instance, some groups need to restrict access to their content. Are there divisions or groups that need to maintain separate data? Will you need different site collections for specialized purposes? When your organization purchases the SharePoint Online service, it is allocated a pool of storage based on the number of user licenses it purchased and the type of Office 365 plan it purchased. For more information, see Manage site collection storage limits. How many site collections do you think you'll need overall? How much storage comes with your subscription? Do we need multi-language support? The Multilingual User Interface (MUI) feature allows users to view sites or web pages in a language other than the default set on the site or site collection. The MUI feature is not a translation tool; it just changes the display language for certain default interface elements. For more information about multilingual sites, see Introduction to multilingual features. Do any site collections need to be created in specific languages? Governance is the set of policies, roles, responsibilities, and processes that control how your organization cooperates to achieve business goals. These goals center on the service you provide and the management of intellectual property your employees create. As you plan your site collections you should also build a plan for how to govern them. When you think about how to structure and govern your site collections, consider the answers to these questions. An effective site collection consists of groups of individuals and teams that share common goals. Does the structure of your site collections add to your organization's effectiveness? A secure site that is open to those who need the information, but where information is blocked from those who should not see it. Does the structure allow the information architecture to meet regulatory requirements, privacy needs, and security goals? A permissions model that allows read access, write access, or both. What type of access will users need to the content? Authorization for external users on only those site collections that need it. For more information about allowing external users access to your sites, see Manage external sharing for your SharePoint Online environment. Do users from outside the company need to have access? A managed plan for sites that are well maintained. Who will be allowed to create and manage the sites in the site collection? Locations for specific actions and applications, such as sandbox solutions. What features and functionality will be enabled for users? A site collection where the content is useful to those sharing the site. Will the content found in search results be relevant to those sharing the site collection? A solution that is manageable and easy to upgrade. How much customization will you allow? As a SharePoint admin, you can delete and restore classic site collections using the SharePoint admin center. For info, see Delete a site collection and Restore a deleted site collection. An important consideration when setting up and deploying a site collection is permission and security. Managing your user base and securing the content and data needs to be considered for a successful site. For info about the SharePoint admin role in Office 365, and about the tasks of a SharePoint admin, see About the SharePoint admin role in Office 365. SharePoint Online provides the capability for site users to invite external users (that is, users who do not have a license to your Office 365 subscription) to view or edit content on sites. External sharing is a powerful collaboration feature that can support your organization's needs to collaborate with external vendors, customers, or clients. However, it is important to manage external sharing carefully to ensure that any content that you do not want shared is adequately protected. For info, see Manage external sharing for your SharePoint Online environment. External sharing is enabled by default for your SharePoint Online environment (tenant) and the site collections in it. You may want to turn it off globally before people start using sites or until you know exactly how you want to use the feature. Once you turn it on globally, you can allow external sharing for specific site collections, while keeping it turned off for site collections that will store content that is sensitive for your business. You should give thoughtful consideration to where you enable external sharing and what level of external sharing you allow. For information about how users can share content, see Share SharePoint files or folders in Office 365. SharePoint Online IRM uses Microsoft Azure Active Directory Rights Management Services (RMS), an information protection technology in Office 365. Information Rights Management (IRM) protection can be applied to files in SharePoint lists and libraries. To learn more, read What is Microsoft Azure Active Directory Rights Management? When IRM has been enabled for a list or library, files are encrypted so that only authorized people can view them or take specific actions on them. Each rights-managed file also contains an issuance license that imposes restrictions on the people who view the file. Typical restrictions include making a file read-only, disabling the copying of text, preventing people from saving a local copy, and preventing people from printing the file. Client programs that can read IRM-supported file types use the issuance license within the rights-managed file to enforce these restrictions. This is how a rights-managed file retains its protection even after it is downloaded. By default, IRM is disabled when you sign up with Office 365. Before you turn on the IRM service using the SharePoint admin center, the Office 365 global admin needs to first install the Microsoft PowerShell module for Rights Management and then connect to the Rights Management service. For more information see Set up Information Rights Management (IRM) in SharePoint admin center and Apply Information Rights Management (IRM) to a list or library. Whether you manage your user accounts in Office 365 only or sync on-premises directory objects, if there's information you want to add to user profiles, but no field for it, then you might consider creating a SharePoint Online user profile property. For info, see Manage user profiles in the SharePoint admin center. Keep in mind that these properties are specific to SharePoint Online and this information will not be replicated to Office 365. If you want to help owners of classic sites target content to specific groups of people, you might want to use audiences. For info, see Manage audiences. There are some features that can be configured or managed globally from the SharePoint admin center. To help you plan time and resources, it is useful to evaluate whether your organization has a business need for specific features. This step will help you determine where you may need to engage subject matter experts in your organization to help partner with admin staff in planning the configuration of these features. For example, to gather the necessary requirements for configuring features like the Term Store, or Records Management features like the Content Organizer, you may need to partner with the people in your organization who are responsible for corporate taxonomy, records management, or content management. Do you need these capabilities? You need to configure Search for your SharePoint Online environment. You want to create and use taxonomies to classify and organize information on sites. You can use the Term Store Management Tool to create, import, and manage hierarchical collections of centrally managed terms (called term sets). You need to work with business data that is stored in external applications, and you want to be able to integrate that data into SharePoint Online sites. You can use Business Connectivity Services to connect to data sources such as SQL Azure databases or Windows Communication Foundation web services (also known as WCF). You need to automatically route content to specified locations based on records management or document management criteria. You want to provide users with the ability to find and install internally-developed business apps or third-party apps to customize and extend sites. As part of your planning, you should evaluate whether your organization has specific business needs that might require you to use third-party services or applications to customize SharePoint Online. For example, your organization might need to migrate a large volume of content or a large number of users to your SharePoint Online site. Or you might have business processes that require support for email-enabled lists. If you think that your organization might benefit from third-party services or applications, please explore the professional services and applications available from partners in the Microsoft Partner Center. You can find experts to help you deploy in the cloud or tailor Microsoft Office 365 for the needs of your business. It is a good idea to explore and research available third-party services and solutions at the beginning of your planning process.